Jennifer Lopez is getting a co-sign from Smokey Robinson after folks lost their minds when it was announced she would be doing the Motown Tribute at tonight's Grammy Awards. Get it all inside. 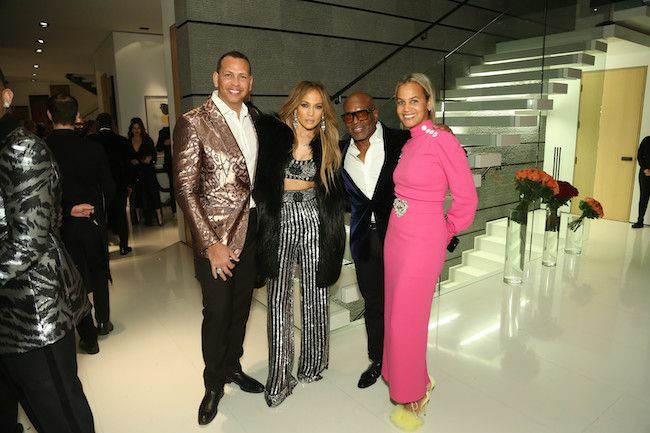 For tonight's Motown tribute at the 61st Grammy Awards, Jennifer Lopez - pictured above with boyfriend Alex Rodriguez and L.A. & Erica Reid at L.A.'s private party at his home Friday - will be an integral part of the performance. Of course, ALL of Black Twitter had jokes when this news first broke. Now, Motown legend Smokey Robinson is saying she's a great choice. Oh? He caught up with Variety at Clive Davis' pre-Grammys gala last night and said she has the credibility because, she grew up in the Bronx. Speaking to Variety’s Marc Malkin outside Clive Davis’ pre-Grammy gala on Saturday, Robinson, who’s also performing in the Motown tribute alongside J.Lo, said Lopez has more than enough credibility “growing up in her Hispanic neighborhood” in the Bronx. But that’s not the point, he said. "Salute to my mom because this is the music we grew up with in my living room." Jennifer's wearing Ralph Russo tonight on the carpet.